If you want to import PST to Windows Live Mail Client than you landed on the right Page. In this article, you learn to import Outlook emails to Windows Live Mail with contacts, calendar data, notes etc. keep reading the post to know the step by step tutorial for PST file to Windows Live Mail migration. PST file stands for Personal Storage Table, used to store emails, contacts, calendar, task, events, and folders. It is a complete mailbox file design and developed by Microsoft for Outlook Application. Windows Live Mail is a Windows-based email client used to send and receive emails. It is a freeware email client developed by Microsoft. You can run WLM on Windows 7, Vista, 8 and also on Windows 10. Windows Live Mail does not have any option to upload PST file. So we need to use a third-party application. For this process, you need to download and Install Advik PST Converter Toolkit. This tool offers the simplest user interface so that any user with a basic knowledge of computer can export PST file into Windows Live Mail client. Step 1. Launch Advik PST Converter Toolkit. Step 2. Add PST file in the Application. Step 3. Select Desired mailbox folders to import. Step 4. Select Windows Live Mail from Multiple Saving Option menu. Step 5. Hit the Convert Button to Start the process. Step 6. Import the converted file in Windows Live Mail. In this way, you can easily export messages from Outlook PST file to Windows Live Mail. 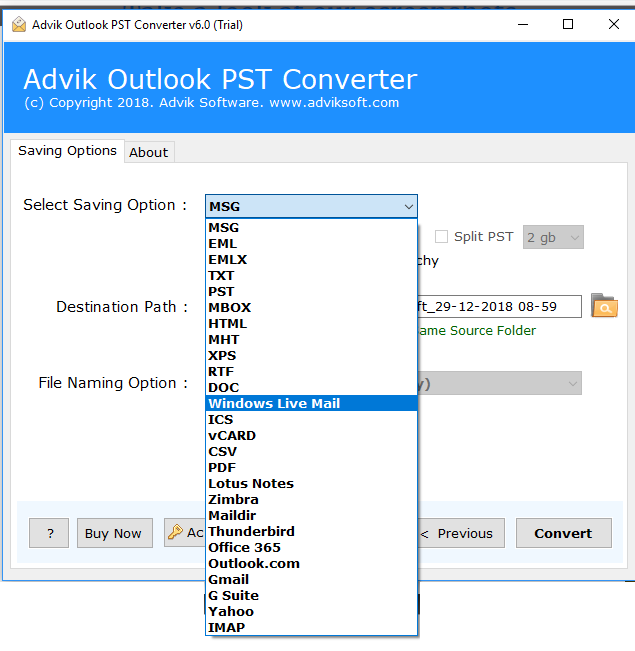 Why Choose Advik Software for PST to Windows Live mail Migration? In this blog, we described the easiest way to import PST file to Windows Live Mail Client. Using this tool you can migrate email messages from PST to Windows Live Mail without losing a bit of information. You can also download this tool for free to check it’s efficiency. Copyright © 2018 Advik Software. All Rights Reserved.